Prestige Deck Coating majors on the majors. We realize that many Southern California homeowners have private pools or belong to a HOA that has a community pool. Pool deck surfaces can become slippery, excessively hot, or cracked. So, we offer top-notch pool deck resurfacing service throughout Orange County Ca and beyond! System. Here is a quick breakdown of the pool deck resurfacing procedure used by Prestige Deck Coating (see diagram below). 1) Apply bonder and fiberglass matting to the existing deck surface. 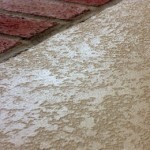 2) Apply a thinly troweled layer of polymer modified concrete. 3) Apply an extra layer of polymer modified concrete is sprayed on previously applied concrete to owner’s desired texture specifications. 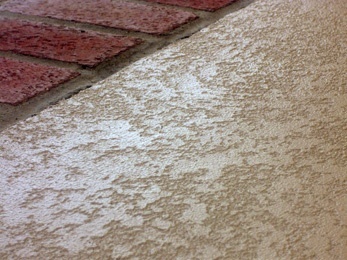 Concrete is troweled to achieve the specified texture. 4) Apply two coats of pigmented concrete/masonry floor paint and sealer (CMFPS). We use two layers of polymer based concrete to reduce any chance of cracking or leaking. Our commercial and residential pool deck products are professionally installed giving your backyard pool area a new beautiful look. Our pool deck resurfacing system has a anti-slip grip finish texture, making your slippery concrete safe to walk on even when wet. With an assortment of stylish colors and textures, we make your outdoor living area a relaxing pleasure. There is no need to break apart and remove your existing concrete, we can patch and cover your old concrete with our durable pool deck materials. Concrete resurfacing is our thing. Unlike starting an entire new installation from the ground up, our pool deck resurfacing systems will protect your pool deck surface like it was new again. Prestige pool deck resurfacing can completely remodel your pool decks, just in time for summer. For all your aesthetic concerns, we can give you texture and color samples galore. It is important to have professional grade pool deck resurfacing products. It is even more crucial to have them installed properly. We at Prestige, major on both aspects of sound pool deck resurfacing principles. Prestige Deck Coating means concrete waterproofing. Check Out Our Gallery of Pool Deck Resurfacing Projects!